"Don't Make A Noise Or I'll Send The Devil A Henchman." COMICS! Sometimes My Eyes Get A Rough Ride! Content, he said tersely, and spun upon his heel to leave.What? Conan. It’s Conan. It’s always been Conan. So cleave the break asunder and have at it with much vigour. 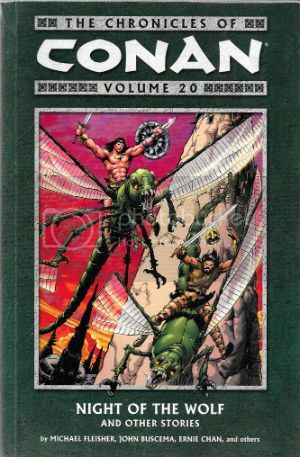 In which I decide to purchase one of Dark Horse’s apparently endless stream of Conan series. Because they are apparently endless aren’t they? But only apparently because everything ends (even Friends, thank Crom). Since his arrival in the Dark Horse stable (ho ho ho) Conan’s been busy; he’s been busy being a Barbarian, a Cimmerian, a King, he’s even done a Bob Hope/Bing Crosby movie (Road of Kings) and now he’s an Avenger (in the general sense rather than the specific sense of Steed and Mrs Peel or those Marvel children’s entertainment movies). This series, Conan and the People of the Black Circle was of fixed length so, yeah, new readers sharpen your axes here. I jumped on board, as they say on the trolleys (Ding! Ding!). 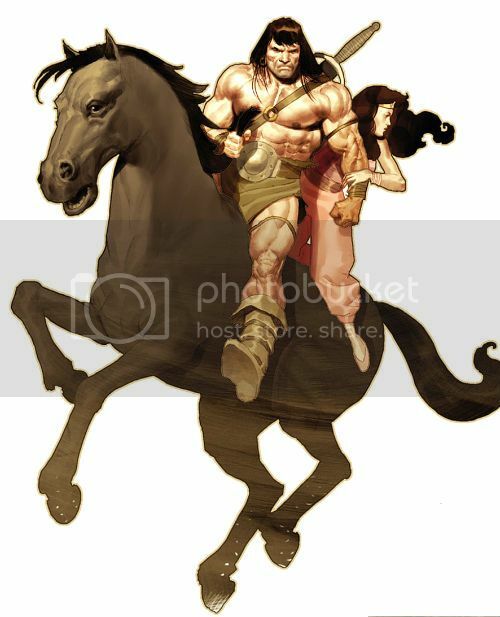 And why not, I have no beef with Conan; fact is I like the fact that there are always Conan comics going on somewhere, it gives life a sense of stability. When you get to my age that’s important. Hey, maybe Conan can fill that gap when Star Wars goes Marvel. Can the audience for the children’s entertainment Star Wars be replaced by that for the geriatric pulp sniffer’s entertainment Conan? Doubtful isn’t it? But that’s Dark Horse’s concern, mine is whether these comics were any good. 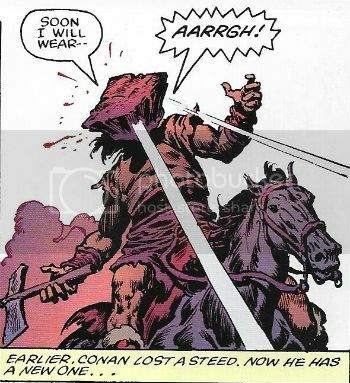 And the comics comprising Conan and the People of The Black Circle were pretty good because for starters the job Fred Van Lente does is a good one. 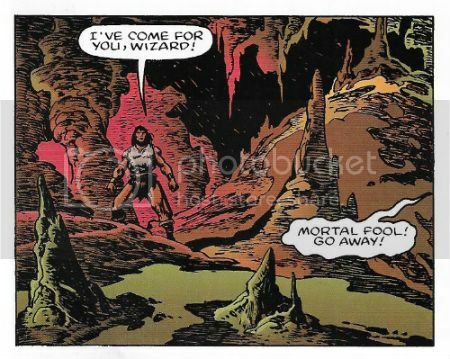 Here he adapts a Robert E Howard short which means, as it is from the source of all things Cimmerian, it’s all as Conan-y as any Conan fan could want. Yeah, Van Lente does a good job though I did get a bit lost at times with all the to-ing and fro-ing and odd names but that’s not really on Van Lente; it’s more on Olivetti’s tendency towards visual uniformity and basically, let’s be fair, my personal inability to focus properly on narratives concerning people and places called things like Pizzazz the wizard and the city of Chuffbundle. I’m not joking either (about my failings; of course I’m joking about the names; get real, hot pants) those made up names just slip right off my brain and since those names come with the territory (the territory of Slickpiddle) it’s hardly the fault of the comic, Van Lente or Robert E Howard. Since someone who shys away from reading books with maps in the front enjoyed Conan and the People of The Black Circle I’d wager a cheeky smile at least that for a fan of this stuff this is good stuff indeed. 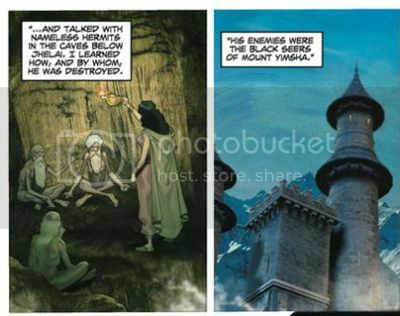 There’s certainly plenty going on, there’s no little intrigue, some surprising developments and a both a wider scope and a greater level of characterisation than I, at least, have come to expect from Conan comics. 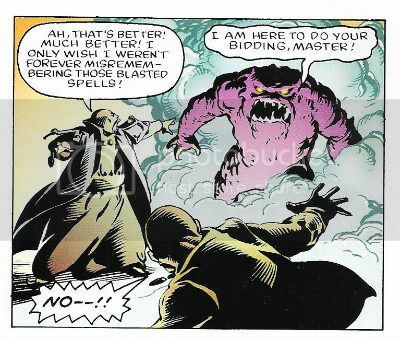 The wizards aren’t just bad men clad in black potato sacks pointing gnarled fingers and hissing, they have a plan, and one of them even has the hots for a lass in harem pants. And as for the lasses, well, yes, the ladies have some agency; one of them is a bad lass and the other’s a princess but even the regal Rita (not her real name) holds her own (as well as Conan’s; calm down, it’s consensual). And Conan? Well, Conan’s Conan but maybe there’s a little more going on under that sofa arm of a brow than usual, but then Conan’s never been quite as thick as he was in that original flick. Nice one, Fred Van Lente! But then there’s Ariel Olivetti. Yes, there certainly is Ariel Olivetti. Now, I know you don’t think so but I almost do myself a mischief sometimes looking for reasons to like things. I know you think otherwise but that’s because, and we’ve all noticed this, you’re really quite negative and you project that onto me. 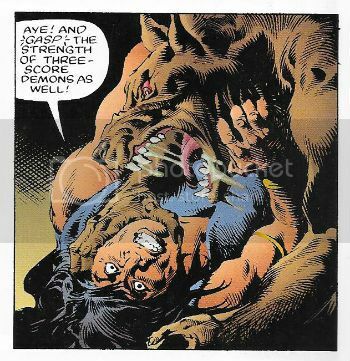 So while it would be easy for me to spit like a wet cat about the art of Ariel Olivetti I’m going to first say that he gives good Conan. 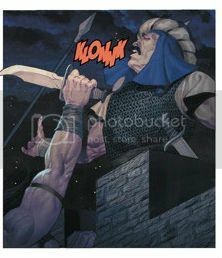 Ariel Olivetti’s Conan is certainly a sight worth seeing; you certainly know he’s about when he’s thugging up the page. Here Conan is all pink tautness, oily sheen, vein bulge and black bangs; like a man shaped pork banger topped with a lady’s wig. There’s a hint of Big John Buscema’s broken nosed Conan about the face (and who broke Conan’s nose? John Severin. Fact.) 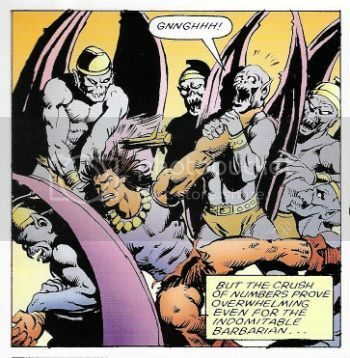 but Olivetti’s Conan would wear Barry Windsor Smith’s sinewy Conan like a feather boa. He’s good, Olivetti’s Conan, I liked him; looking good out there, Conan. In fact all of Olivetti’s figures are good, really good; there’s a definite sense of density and conviction in the details which really sells them. And if there’s a tendency towards sameness (and there is; I mentioned it early, keep up) only intensive effort could avoid this when costumes and face foliage are, as the material dictates, so interchangeable. And, really, why expend that effort when ninety nine per cent of the people in the panels will shortly be dead. Because after all this is a Conan story and if you looked down on Conan with God’s eye then you’d see him as the point of an arrow of corpses stretching round the globe to a small village in Cimmeria. Yes, Olivetti’s people are quite, quite convincing even though the hats they wear look liked iced gems. Especially so, even. Unfortunately (and it’s the bane of my life too, so I sympathise) people have to exist in a world and the world Olivetti gives us here is somewhat less than convincing. Which is weird because a lot of the time it consists of photographs or computer modelled scenery far more realistic than his convincing but clearly fantastical figure work. And so Olivetti’s excellent figures occupy a world seemingly wrought from combining snaps taken on the Olivetti family Tuscan holiday (circa 1987; caravans airbrushed out) and bits of children’s plastic castles. Being as kind as can be at its best this approach creates a wonderful sense of Harryhausen-ness with the discreteness of the elements (and the clear artificiality of one set) forcing your mind to just go with it; to just deal with it. Unfortunately a lot of the success of that approach in movies rests on the presence of motion for your imagination to be swept along by. Alas, motion is something comics are not known for possessing being as they are largely static in nature. Mostly then Olivetti’s approach flops flat on its face as firmly as a Gwangi with lassoed legs. Being slightly more realistic with the praise then, it’s a lot like that collage stuff Richard Corben did in the 1970s but I didn’t like that much either, and I like Richard Corben’s work significantly more than I do the work of Ariel Olivetti. Also, it’s 2014 and I’m not sure it’s a good use of more technology than got us to the moon to replicate mistakes made in comics four decades ago. For Corben those effects were a step on the road to a better artistic place but for Olivetti they threaten to become an artistic pothole he’s decided to curl up and kip in for the duration. And finally, to be most unkind; at its worst it’s a goddam eyesore. Bit of a mixed bag visually then. 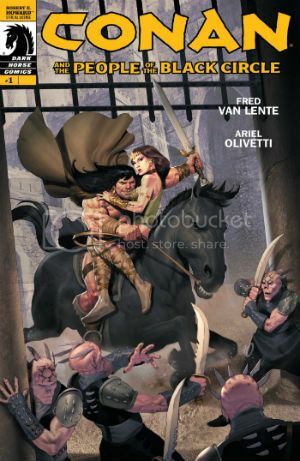 Sometimes Olivetti’s approach hits the cinefantastique jackpot and raises Van Lente’s solid efforts but mostly it doesn’t and so Conan and the People of The Black Circle can't quite get higher than OKAY! 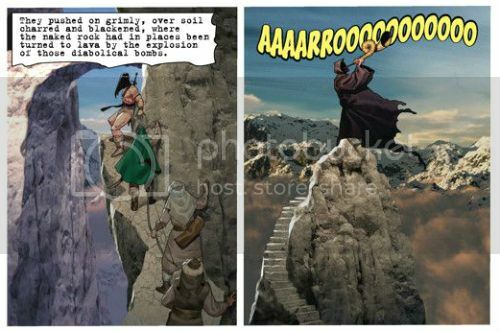 And having no further concern, he and his companions sought adventure in the…COMICS!! !